Sale ends 5:00pm (AEST) 6 May 2019. Valid for travel: 28 January to 20 September 2019. The travel period has black-out dates: 22 - 23 Mar & 5 - 27 Apr 2019. Cancellations, amendments or refunds not permitted. Subject to availability and may be withdrawn at anytime if sold out. Available for new bookings only & not in conjunction with any other offer. Base room rate is discounted only. Extra Person rate is not eligible for the discount. Boardwalk Burleigh Beach is a luxurious oasis designed to offer you the best in lifestyle and location. With the state of the art facilities and sleek, modern design, this really is prestige accommodation. 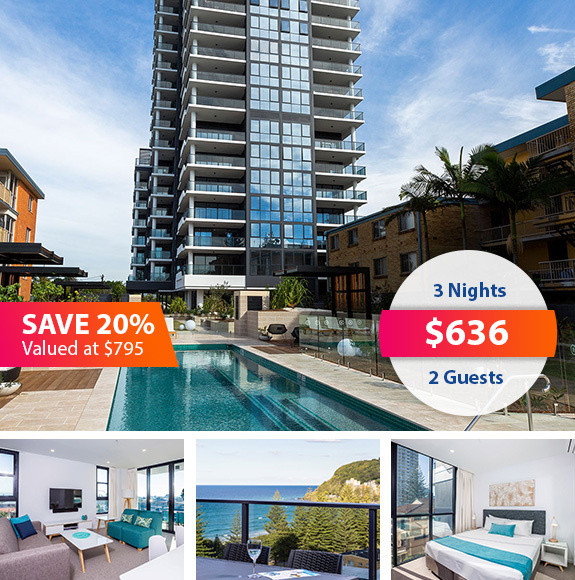 Boardwalk Burleigh Beach has so much to offer from the incredible ocean views, contemporary internal and external design and cutting edge facilities, there is no doubt this resort is perfect for your next lavish getaway. Not only does Boardwalk Burleigh offer the best in Burleigh Heads luxury, but our holiday apartments are located only a short walk from the centre of the town. With Burleigh’s eclectic atmosphere and limitless trendy cafes, restaurants and bars, you will shortly find yourself immersed in the energy and laid back lifestyle the town has to offer. Boardwalk Burleigh Heads has three room types available for hire being a One Bedroom Apartment, Two Bedroom Apartments with one shared bathroom, Two Bedroom Apartment with a bathroom and ensuite and finally the Three Bedroom Apartment. No matter the occasion, this resort will be able to accommodate you and your guests. * No arrivals or departures are permitted on Christmas Day. Undercover secure parking is available free of charge for one vehicle.